Remember the back-in-the-day anxiety associated with getting a new printer, bringing it home, plugging it in and crossing your fingers? Yeah, I don’t like to think about it either. Generally, the reason that ‘stupid printer’ sat idly, no matter how many times you pressed the Print command, was because it couldn’t talk to your computer, and needed an updated device driver. This tiny piece of code converted a click on the Print command into a message that your printer could understand. Inside the printer was a chip that received that command, and converted that message into a Print command that your new printer could understand. Inside that chip, inside that printer, was code called firmware (also referred to as embedded software). It was that code that translated that message from your computer into a command that the printer recognized and could act on. That embedded software is what made your printer work. That is, the hardware can’t function without firmware, just like Excel® can’t run without Windows or OSX. Embedded software developers use different testing and debugging tools than software developers, like an oscilloscope or a logic analyzer. 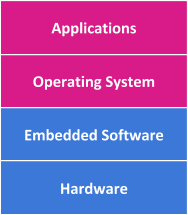 Embedded software developers focus on making a machine function; a software developer oftentimes is focused on systems-level control. They program in different languages, like C, C++ or Windows IoT, while software developers develop applications using C# or Java. Their goals differ as well. An embedded developer may be working on a program that will send a blood pressure monitor in a hospital into alarm if a person’s blood pressure drops below a specified level. Advanced manufacturing techniques will surely result in smaller, faster components. But, without firmware it won’t matter – these faster more advanced machines simply won’t work without firmware. How does this impact your Product Roadmap? A company competing in technology-based markets can only become more and more reliant on its ability to identify, recruit and retain embedded software developers. Those that solve this challenge will be positioned to win. Those that don’t will be relegated to the bone pile. IQ has been recruiting and employing embedded software developers for over two decades. We are experts at sourcing and attracting top-shelf firmware developers, both for our internal consulting team, and on behalf of our clients. That includes screening for technical capabilities and ensuring that your new recruits and consultants are the right fit for your workplace and culture. If you’re facing this challenge today, or see it in your near future, please contact IQ for a free consultation about your needs and how IQ can help you execute on your product roadmap.